What Are Gold Collar Jobs? 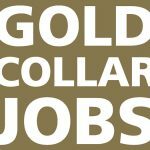 Gold collar jobs — why call them that? Simply put, these high-demand careers have some serious earning potential. You can earn anywhere from $40,000-$70,000 per year with a degree from OTC. Plus, you can complete most of our programs in just two years. Just fill in the quick form below and once submitted you will be given the opportunity to explore more about your program of choice.